Minutes after Jeff Burrows noticed a puff of smoke rising from Roaring Lion Canyon, on Sunday afternoon, July 31, his dispatch radio crackled. The volunteer firefighter raced to the station in Hamilton, Montana, suited up, and awaited orders as fire chiefs scouted the blaze on the Bitterroot National Forest. By the time he sped up Roaring Lion Road toward his home and hopped off the fire truck to help his wife and two kids evacuate, the fire, fueled by tinder-dry conditions and 30-plus mph winds, had already blown up. “I’ve never seen fire move that fast before,” Burrows says. His house was spared, but others were not: In its first hours, the Roaring Lion Fire destroyed 16 homes and dozens of outbuildings. Burrows worked the fireline until 1 a.m., hauling hose through smoke so thick it obscured all light except that of flame and falling embers. The next morning, as Forest Service hotshot crews, water-dumping helicopters and bulldozers attacked the flames, he went back, exhausted, to his regular job as a Ravalli County commissioner. Roaring Lion isn’t the worst wildfire to strike Ravalli County, where the small towns and scattered homes of the Bitterroot Valley abut the national forest boundary. In 2000, a 356,000-acre fire complex — the nation’s biggest during an exceptionally destructive wildfire season — charred 70 homes here. The damage helped spur county commissioners and others to adopt some measures to reduce communities’ wildfire risk, including tree-thinning projects that later helped save homes from the Roaring Lion Fire. Ravalli County isn’t alone in its unwillingness to rein in development in the increasingly flammable wildland-urban interface (or WUI, pronounced WOO-ee). According to researchers at Headwaters Economics, a Bozeman, Montana-based nonprofit, most Western counties, whatever their politics, generally allow risky home construction. This, in turn, puts a growing burden on the U.S. Forest Service, which bears the brunt of the region’s firefighting costs. In 2015, the agency spent more than half its $6.5 billion budget on wildfire-related activities, largely because of pressure to defend private property. 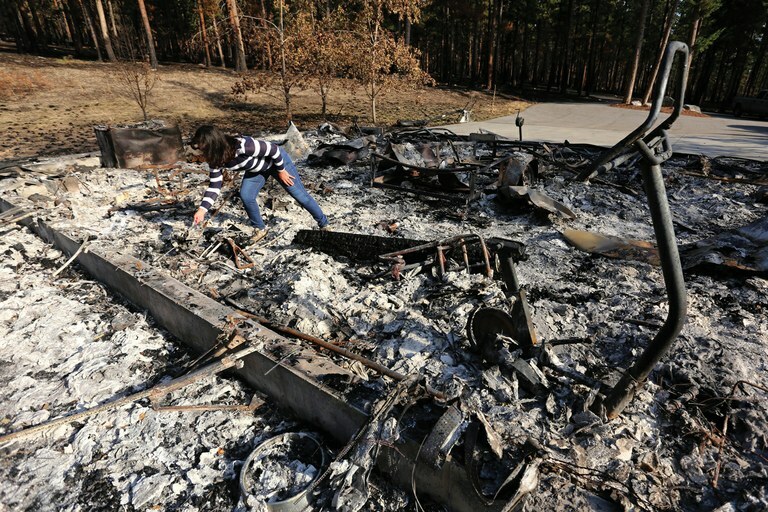 Anita Andre sifts through the ashes of her garage, which was burned down by the Roaring Lion Fire in Ravalli County, Montana. Fortunately her house, set in 30 acres of ponderosa pine forest, survived, perhaps due to the green grass surrounding it. In the aftermath of the 2000 fire season, Western counties were pushed to get more aggressive about fireproofing their communities. Federal lands agencies created a National Fire Plan to better coordinate wildfire efforts with state and local governments. The plan spurred Bitter Root Resource Conservation and Development, a Hamilton-based nonprofit, to begin assisting landowners in Ravalli and two neighboring counties to thin trees and other vegetation on their properties. Nearly 650 Ravalli landowners have since done so. Then, following another destructive fire season in 2002, Congress passed the Healthy Forests Restoration Act of 2003, which among other things incentivized local governments to adopt “community wildfire protection plans.” When Bitter Root RC&D brought together federal, state and county officials to draft such a plan for Ravalli County, county commissioners endorsed many local initiatives, including prioritizing thinning projects on certain private lands. The plan even succeeded in getting the county to mention “defensible space” — created by clearing vegetation away from homes — in its comprehensive planning document, or growth policy. But it didn’t lead to any regulations discouraging further development in the WUI. The county appeared ready to get more aggressive in 2007, when Ravalli-area legislators helped pass a state bill requiring all Montana counties to consider wildfire risk in their growth policies and subdivision regulations. Meanwhile, pro-planning leaders, concerned about Ravalli County’s rapid population growth — from 1990 to 2010 it grew 60 percent, to a population of 40,000 — proposed county-wide zoning that could have been a powerful tool for regulating development in the WUI. But in 2008, the anti-planning forces mounted a citizen ballot initiative to entirely repeal the county’s growth policy, a prerequisite for zoning under Montana law. And they won. Another state bill, in 2009, required counties to map their WUI areas. But even creating a map proved controversial. Bitter Root RC&D partnered with the county’s 13 rural fire districts, the county sheriff and other local officials, plus GIS and fire behavior experts, to produce a detailed map of Ravalli County’s WUI. But in 2011, under pressure from residents afraid that the map would lead to higher insurance premiums or more regulations, the county commission refused to adopt it. It’s unlikely that better maps or stronger regulations would have spared many homes from Roaring Lion’s wrath. Most were built in the 1980s or before, so even using zoning to make the WUI off-limits to development wouldn’t have helped. According to Ravalli County planning director Terry Nelson, more recent housing development, both in the Roaring Lion area and across the county, has occurred mostly on existing lots or on parcels created with exemptions from Ravalli’s subdivision regulations, which require on-site water storage, firefighter access and defensible space. But a thinning and logging project called the Westside Collaborative Vegetation Management Project might have made a major difference if it had been completed prior to the July blowup. The project was scheduled to treat national forest along roughly six miles of the WUI in the Roaring Lion area beginning this fall. Local environmentalists and other residents raised concerns about road-building and truck traffic, largely because the project includes a commercial timber sale intended to help pay for unprofitable hand-thinning. Commissioners, including Burrows, who was elected in 2012, cite the project’s years-long approval process as evidence that the Forest Service is unacceptably burdened with regulations. But they also objected because the project would decommission some forest roads they’d like to see remain open. Byron Bonney surveys the damage done by the Roaring Lion Fire. The forest fuel treatments that Bonney has administered for Bitter Root Resource, Conservation & Development helped to spare several residences from the flames, but 16 homes, including some that received the fuel treatments, were destroyed. For Burrows, the main lesson of Roaring Lion is that more trees should be cut on public land to reduce its flammability — a popular stance in a county with a dying timber industry. Other commissioners agree. But the Forest Service hasn’t been idle. In addition to monitoring or suppressing more than 200 sizeable wildfires in and around Ravalli County since 2000, it has logged, thinned or performed prescribed burns on more than 120,000 acres of public land, arguably treating the majority of the WUI yet uncharred by wildfire. Yet the commissioners propose no reciprocal county action on private lands, other than encouraging tree-thinning and fire-resistant construction by willing landowners. “Our citizens have been very clear that they don’t want more regulation,” says Greg Chilcott, a Ravalli County commissioner who was first elected in 2002. Major reform is unlikely to occur anytime soon. But that didn’t stop Bonney from contemplating his next visit with Ravalli commissioners as he surveyed the wreckage of the 8,500-acre Roaring Lion Fire, still smoldering on high slopes in mid-August. The fire destroyed seven homes that had received thinning treatment through Bitter Root RC&D’s grant program. But others survived despite no initial aid from firefighters, owing to fire-resistant building methods and the vegetation treatments, plus a bit of luck, Bonney says. He’d like commissioners to learn from that, and to seriously consider updating subdivision and building material requirements. Roughly 80 percent of Ravalli County’s WUI is still undeveloped, so new policies could make a major difference.